Pyg Track, Snowdon, Wales, UK. I found this print again the other day whilst having a rummage for something else. Given the current liking for digital effects filters such as Instagram and as of today, Twitter, offer and the superficial similarity with the way this image looks here, I thought it would be worth talking about. The light was great at times that afternoon in summer 1994 but, as often is the case up in the wilds of North Wales, not 5 minutes after the shot was made there was torrential side-ways rain which soaked through the jeans both my walking buddy and I had stupidly put on. As a result we got very cold all of a sudden so beat a hasty retreat back down the track to the car. A wise move then, even if we hadn’t been when setting off so ill-equipped (and on a whim if I recall correctly). Mountain weather can turn on you in a moment so you should really prepare for the worst it can throw at you. In some ways the print now serves as an apt reminder of the peak that day. Does it matter how the effect was achieved? Would it have been as valid if a phone camera with a digital filter app had been around then and I had shot it on that? Certainly the effects wouldn’t have been unique as they are here – no hand-print is quite the same as the next, for one. Then there is intent and the depth of it to consider. You can use digital post production to bring out elements of a raw file not seen in a baked-in-the-camera jpeg so it’s not necessarily a pure digital vs film argument for me (although the hands-on nature of the real darkroom was both harder and great fun but sadly there is little time allowed for it commercially now). Going back to the original camera phone/app question, I think it’s a bit like comparing restaurant cuisine to ready meals. What do you think? Does the overuse of app filters for ‘throwaway snaps’ cheapen the hard-worked intent of others or is it just a passing fad with no negative impact on ‘serious’ work? 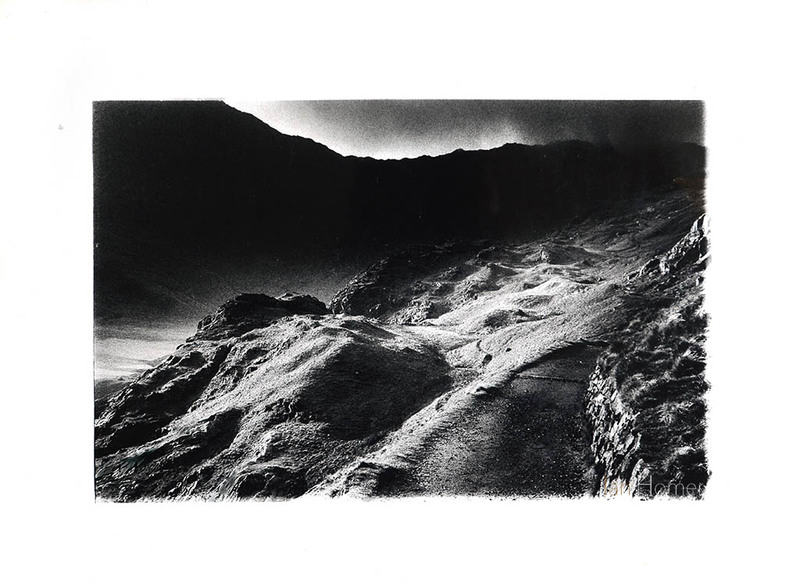 This entry was posted in Current Affairs, Darkroom, debate, Hand Printing, Industry, Landscape, Photography, Reflective and tagged apps, cameras, darkroom, debate, digital, future, hand-print, Instagram, landscape, monochrome, moody, mountains, phone, photography, printing, scenery, Snowdon, Snowdonia, UK, Wales, walk, walking. Bookmark the permalink.